Since the dawn of the precision medicine era, the entire gamut of the healthcare industry has witnessed a paradigm change toward more precise diagnostics. The increasing prevalence of chronic disorders and an overall increased demand for preventive medication with minimal/no side-effect are promoting the growth of the global molecular diagnostics market, providing platform for the designing and development of highly enhanced and optimum products that would direct patients to their appropriate treatment modules. These individualized care regimes are improving the quality of life of the patients and reducing economic, societal, and clinical burden, projecting a future of prosperity. Presently, product categories within the molecular diagnostics market include kits and consumables, systems, and software and others. Till date, the healthcare industry has witnessed a number of successful products that have contributed significantly in enhancing the technological advancements in making molecular diagnostics more precise. However, the consistent evolution of the market has further necessitated the insurgence of more advanced research initiatives that look to devise the optimum assay with the confluence of multiplexing and low cost. Additionally, with systems being developed at the interface of different technologies, precision diagnostics is soon to become a widespread reality. The purpose of the study is to gain a holistic view of the global molecular diagnostics market in terms of various factors, including regulatory reforms and technological advancements, which are influencing the market. The market has been segmented into ‘products’, ‘applications’, ‘technologies’, ‘end-users’, and ‘regions’. The scope of this report is centered upon conducting a detailed study of the products allied with the molecular diagnostics market. In addition, the study also includes the exhaustive information on the unmet needs, perception on the new products, competitive landscape, market share of leading manufacturers, growth potential of each product, application, technology, end-user, region, and companies, as well as other vital information with respect to molecular diagnostics market. The report presents the reader with an opportunity to unlock comprehensive insights with respect to the market and helps in forming well-informed strategic decisions. The research uncovers some of the substantial parameters that must be taken into consideration before entering into the market. This research report aims at answering various aspects of the global molecular diagnostics market with the help of the key factors driving the market, the restraints, and the current growth opportunities that are going to shape the future trajectory of the market expansion. The report includes an in-depth examination of the key players and recent developments taking place in this market. Moreover, the report includes chapters on market dynamics (market drivers, opportunities, and challenges) and industry analysis as well. The research study highlights the factors governing the industry attractiveness with Porter’s Five Forces for a comprehensive understanding of the global molecular diagnostics market. 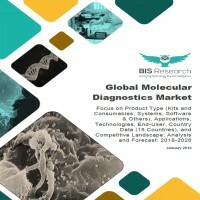 Moreover, the study includes detailed product mapping, market estimation, and analysis of key trends in multiple geographical regions, growth of molecular diagnostics market in each region for different applications, and the key strategies and developments by the prominent molecular diagnostics manufacturers. • What are the major market drivers, challenges, and opportunities in the global molecular diagnostics market? • What are the underlying structures resulting in the emerging trends within the global molecular diagnostics market? • How will each segment of the global molecular diagnostics market grow during the forecast period and what will be the revenue generated by each of the segments by the end of 2028? • What are the key developmental strategies which are implemented by the major players in order to sustain in the competitive market? What are the key regulatory implications in developed and developing regions for molecular diagnostics? • Who are the leading players with significant offerings to the global molecular diagnostics market? What is the current market dominance for each of these leading players? • What would be the compound growth rate witnessed by the leading players in the market during the forecast period 2018-2028? Which molecular diagnostic product type is having the most promising growth? • What are the key applications in global molecular diagnostics market? What are the major segments of these applications? What technologies are dominating these application segments? • What are the major technologies that are employed in the global molecular diagnostics market? Which is the dominating technology? • Who are the primary end-users of the global molecular diagnostics market? Which is the fastest growing end-use segment in the global molecular diagnostics market? • Who are the key manufacturers in the global molecular diagnostics market, and what are their contributions? Also, what is the growth potential of each major molecular diagnostics manufacturer? • What is the scope of the global molecular diagnostics market in North America, Europe, Asia-Pacific, Latin America, and Rest-of-the-World? Which molecular diagnostics application dominates these regions? • What are the emerging trends in the global molecular diagnostics market? How are these trends revolutionizing the diagnostic procedure? • Which technologies are anticipated to break-through the current molecular diagnostic regime? • Which companies are anticipated to be highly disruptive in the future and why? • What are the regulatory procedures that are required to unify the approval process for emerging molecular diagnostics? How will they enhance the reimbursement scenario? • What are the gaps in regularizing optimum molecular diagnostic adoption in regular healthcare routines? How are these gaps being tackled? The key manufacturers who have been contributing significantly to the global molecular diagnostics market include Abbott Laboratories, Agilent Technologies, Inc., Becton, Dickinson and Company, bioMérieux S.A., Bio-Rad Laboratories, Inc., Danaher Corporation, F. Hoffmann-La Roche AG, Illumina, Inc., QIAGEN N.V., Siemens Healthineers, Inc., and Thermo Fisher Scientific Inc., among others. 10.18 HTG Molecular Diagnostics, Inc.
As the World Health Organization states, the global healthcare expenditure is on course to be an exorbitant $8.5 trillion in 2020, owing to an increasing economic burden of chronic diseases, which are estimated to constitute almost 43% of the global economic burden. Thus, the soaring demand for better treatment outcome is leading to an ascending need for preventive, precise healthcare, and tailored medication. The growth of the precision medicine market over the last few years (2010-2017) has been colossal and has significantly contributed to giving rise to a number of parallel fields of study and possible healthcare implementations. Molecular diagnostics have revolutionized the overall precision medicine industry by adopting highly advancing technologies, further giving rise to several inclusive applications including core molecular diagnostics, companion diagnostics, liquid biopsy, and non-invasive prenatal testing. As one of the most transformative, and dynamic areas of diagnostics, molecular diagnostics have made significant strides in research and treatment dissemination that have been continuously revolutionizing healthcare across a broad continuum of diseases and health conditions. The evolution of molecular diagnostics into a more integrative aspect of healthcare routines has been widely established by significant laboratory tests in infectious disease and genetic screening, and a continuously increasing number in oncology. The insurgence of massively parallel methods is increasingly allowing the sequencing of entire genomes at very low costs. Further, owing to the rapid advancements being undertaken in the industry and being led by revolutionary initiatives of developing mobile point-of-care systems and optimizing assays with the confluence of multiplexing at low costs, the global molecular diagnostics industry is set to witness significant evolution into more precise and accurate diagnostics. With a critical role in the global precision medicine phenomenon, molecular diagnostics are responsible for ensuring safe and effective application of targeted therapeutics, thus enabling better care with the ultimate aim of lowering the economic burden of diseases on populations. The increasing prevalence of chronic disorders and an overall increased demand for preventive medication with minimal/no side-effect are promoting the growth of the global molecular diagnostics market, providing platform for the designing and development of highly enhanced and optimum products that would direct patients to their appropriate treatment modules. These individualized care regimes are improving quality of life of the patients and reducing economic, societal, and clinical burden, projecting a future of prosperity. Presently, product categories within the molecular diagnostics market include kits and consumables, systems, and software and others. Till date, the healthcare industry has witnessed a number of successful products that have contributed significantly to the enhancement of technological advancements in making molecular diagnostics more precise. However, the consistent evolution of the market has further necessitated the insurgence of more advanced research initiatives that look to devise the optimum assay with the confluence of multiplexing and low cost. Additionally, with systems being developed at the interface of different technologies, precision diagnostics is soon to become a widespread reality. As of 2018, the molecular diagnostics can be seen to have exposure in almost all the developed countries. However, with the rapid advancements taking place and an exponential progression in the number of companies entering the space, access to consumers is bound to become easier, thus significantly increasing the exposure in less-developed countries. The global molecular diagnostics market has been witnessing a steady growth since the end of the Human Genome Project in 2003. The market is expected to continue to grow with a double digit CAGR of 10.89% during the forecast period, 2018-2028. Growing at a CAGR of 11.08% during the forecast period of 2018-2028, the kits and consumables product segment is anticipated to generate a value of $20.33 billion in 2028. However, the global market for software and other products is anticipated to grow at the fastest CAGR of 11.74% during the forecast period 2018-2028. The purpose of the study is to gain a holistic view of the global molecular diagnostics market in terms of various factors, such as recent trends and product advancements, influencing the market. The scope of this report is centered upon conducting a detailed study of the products allied with the molecular diagnostics market, which includes various products such as kits and consumables, systems, and software and others. However, the market estimation only comprises manufacturers of molecular diagnostics. The molecular diagnostics market is segmented into five different segments namely products, applications, technologies, end-user, and region. These segments are further segmented into several sub-segments to ease the market estimation and to gain a holistic view of the market. The global market value was estimated using different approaches and validated with one another. Based on the region, the global molecular diagnostics market is segmented into North America, Europe, Asia-Pacific, Latin America, and Rest-of-the-World (RoW). North America is the leading contributor to the global molecular diagnostics market and was responsible for a 46.29% share of the global market values in 2017. However, the Asia-Pacific region is expected to grow at the fastest pace among all other regions with a CAGR of 12.80% during the forecast period 2018-2028.